Who opens with a 30-barrel system? Matchless Brewing Co. in Tumwater, Washington, that’s who. 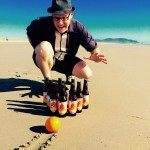 Award-winning brewmaster Patrick Jansen — who helped lead Three Magnets Brewing Co. to prominence — opened Matchless June 24, 2017, with Grant Bolt, and quickly built a reputation for its wide variety of top notch beers. 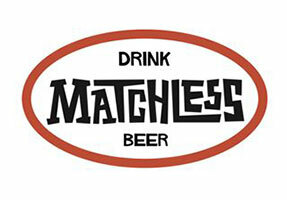 Shortly after opening, Matchless brought home five medals at the Washington Beer Awards. The brewery reached its production capacity of 2,000 barrels in the first. It’s rare for a craft brewery to excel, and win awards, for all beer styles. 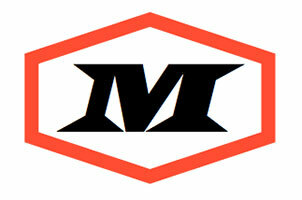 Matchless does. Today, Peaks and Pints presents a flight of Matchless that we call Craft Beer Crosscut 3.30.19: A Flight of Matchless. There are beers, there are cocktails, and there are beer cocktails. Then, there are also beers that taste like cocktails. 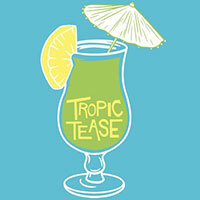 Matchless Tropic Tease reminds Peaks and Pints of a The Pearl Harbor vodka highball. Pineapple, melon and a touch of lime in the form of Citra, Amarillo and Vic Secret hops swirls with a soft, full mouthfeel and zero bitterness. At a crushable ABV and double dry hopped at double IPA levels, the only thing missing is the beach. Leopold Schmidt, a German immigrant from Montana, founded The Capital Brewing Company at Tumwater Falls on the Deschutes River in Tumwater, Washington. He built a four-story wooden brewhouse, a five-story cellar building, a one-story ice factory powered by the lower falls, and a bottling and keg plant and in 1896, began brewing and selling Olympia Beer. 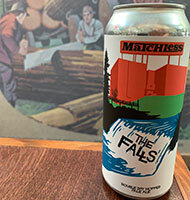 Matchless The Falls (Pale Ale) pays homage to said falls. Hazy but classic, hoppy but never too bitter, balanced and not heavy, The Falls is double dry-hopped with Mosaic, Citra and Amarillo and drinks twice its weight. Ah, Nerd Alert. Nerd Alert! was the Weekly Volcano’s recurring events calendar devoted to all things nerdy. Today, Nerd Alert is a hazy IPA brewed by Matchless Brewing, giving nod to the beer nerds who first discovered hazy IPAs. Nerd Alert combines some of the Tumwater brewery’s favorite aspects of the haze movement — soft mouthfeel, medium bitterness, light acidity, and juice for days — into a single pint of satisfaction. All those Citra and Motueka hops along with pils malt, flaked rye, rice, spelt and our favorite Juice yeast make for bright, er, hazy future. Before Spark Joy’s brew day, Matchless Head Brewer Patrick Jansen took a moment to thank his brewhouse. He’ll be the first to admit he doesn’t always have the most organized hop storage. On that brew day he asked what sparks his joy. Centennial did, reflecting on a time when brewers boiled hops. He grabbed handfuls of Blanc and Mosaic and thanked them too before throwing them into the whirlpool. His yeast felt as if every cell was lifted up. He dry hopped with Citra cryo to keep it clutter-free by removing excess hop debris. Does this scenario spark enough joy for us to tap Spark Joy (IPA)? Indeed. In March 2015, Robby Bessey and Andrew Babcock opened Edison City Alehouse in the neighborhood near South 56th Street and South Tacoma Way. Locals know that part of Tacoma as Edison City, which is why Bessey and Babcock coined it as such. 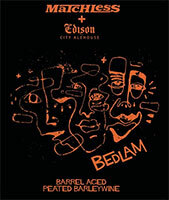 This month, Bessey and Babcock celebrated their fourth anniversary with a special barleywine brewed by Matchless, Bedlam. It’s a decadent, peated barleywine aged in peated whiskey barrels for 12 months. Peat, peat, peat, and delicious.